The present day route 1 is a shadow of its former self. The route once ran from Willesden to Lewisham, and more recently provided part of the service between Lewisham and Bromley. However it has since retracted at both ends, largely without direct replacement, and now only runs between Canada Water station and Tottenham Court Road station. The new night equivalent, N1, goes off in a completely different direction, to Thamesmead. Although essentially now a south London route, it was won late in 1998 by First Capital, a company from North East London, which operated it from a base in distant Dagenham! The route was later re-allocted a bit nearer home at Hackney. Changes connected with the Jubilee Line extension in 1999 saw the 199 withdrawn between Surrey Quays and Elephant & Castle. Once again the 1 became the only route serving South Bermondsey on an East-West axis, the theory being that passengers would transfer to the Jubilee Line. Needless to say, they did not, and severe overcrowding resulted at peak times on this section. Extra buses had to be introduced; these were provided by a variety of operators, but notably Blue Triangle. They were eventually absorbed into the main schedule by First Capital itself. Meanwhile, London Buses owned East Thames Buses found itself needing to re-locate from Ash Grove to make way for the new bendy buses on the 38, and a suitable base was found in Southwark. However, most of the Ash Grove routes were well away from Southwark, so it made sense for a swaparound of routes to occur, and ETB’s routes north of the Thames (128/150) were put out to tender while ETB assumed the 1/N1, which were due for tender in November anyway. These changes took place on 15 October 2005, and ETB’s batch of newish Volvo B7TLs with Wright Eclipse Gemini bodywork duly transferred onto the 1. New London mayor Boris Johnson took a dim view of TfL running its own buses, and the operation was duly privatised, being sold to Go-Ahead's London General subsidiary in a competition that surprisingly only attracted too bidders – perhaps because other companies thought taking on such an inefficient operation was too great a risk. Go-Ahead had the advantage of already operating in the area and has been able to move the routes around between its garages to reduce operating costs. The 1, however, already ran very close to its base in Mandela Way, and so all that happened is that the route transferred over into London General's existing garage right next door. 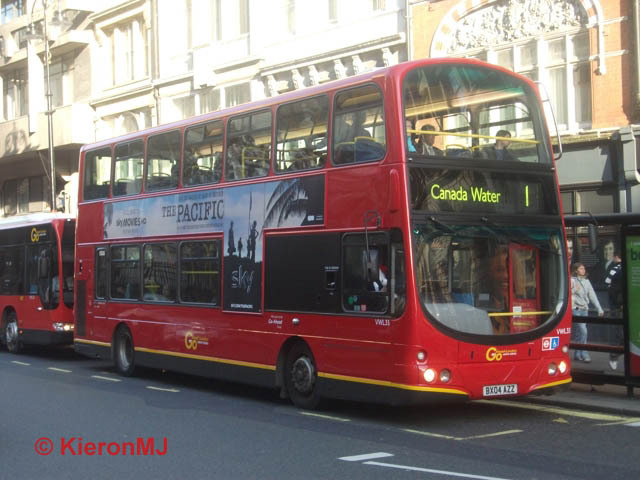 The buses transferred with the route and, marking a rare and welcome change away from all-over red, have mostly been re-painted into standard Go-Ahead London livery – the individual fleet names of the 'Go-Ahead London' group of companies are not now being used, to aid fleet flexibility. VWL35 (BX04 AZZ) is one of the vehicles involved, and presents a smart appearance in this view. London General's own classification for similar buses is WVL, but these differ by being long wheelbase – a configuration that the Go-Ahead London companies have somehow managed to avoid until now, apart from an odd vehicle at Blue Triangle, another acquired company. Certainly the heavy peak loadings still encountered on the 1 make this layout highly desirable, providing as it does much-needed additional capacity.